One of the most visited natural places in Upper Beaconsfield is Cardinia Reservoir Park. It offers open parkland, picnic and barbeque areas and native bushland areas abounding with native flora and fauna. The main entrance is in Duffy’s road, Narre Warren East (Melway 126 C11) but the park be accessed via a rear entrance in Red Hill Road (Melway 210 G4), Upper Beaconsfield. Cardinia Reservoir Park Note (PDF 758kb). Opening and closing times of park gates vary throughout the year. Nearby, along Beaconsfield-Emerald Road, is Elephant Rock an example of the many granite outcrops in the area. For those interested in history, visit the Emerald Museum and Nobelius Heritage Park. Opening hours are Sunday 1.30-4pm and Wednesday 10am-3pm and by appointment. 5968 2152. Bushland Reserves Cardinia Shire has over 70 bushland reserves, each one is unique and home to a range of plants and native animals. A number of these reserves are in or within easy reach of Upper Beaconsfield. The Critchley Parker Jnr Forest Reserve (pictured above) is a large area of preserved bushland off St Georges Road (Melway 212 E11). It was donated to be preserved by Kathleen Parker, in memory of her son Critchley, who perished in Tasmania in 1942. It was in this forest that 21 fire-fighters lost their lives in the disastrous Ash Wednesday bushfires on 16 February 1983. A beautifully constructed marble memorial, listing the names of those who perished, is located on the track not far from the northern entrance to the reserve. There are two main circuit walking tracks in the reserve, which wind their way down the valley, passing through extensive timber regrowth. RJ Chambers Flora and Fauna Reserve is located on Bourkes Creek Road in Upper Pakenham (Melway 313 G8). The reserve covers just over 121 hectares and was selectively logged in the early 1900s and 1960s. The terrain is hilly with rocky outcrops, creeks and wetlands so walkers will need a moderate level of fitness. In this reserve of high flora and fauna values can be found heathy woodlands, herb fields, creek side forest and wetlands. Swamp wallabies, antechinus, wrens and lyrebirds have been seen. The reserve also has public toilet facilities, visitor information board, nature notes, shelter, picnic tables, barbecue facilities, horse trails around the perimeter, and walking trails. Dogs are not permitted. 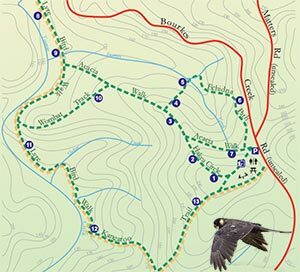 Download the nature trail notes.